The first action item on the agenda was to decide what to do regarding the recently vacated Council position, after Mike Haynes had to leave because he moved outside of Adel. 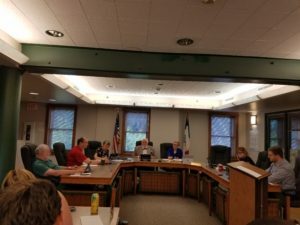 Per the recommendation of Mayor Jim Peters and City Attorney Kristine Stone, the Council agreed to fill the vacancy by appointment, which will be addressed at a meeting in July. Following that, the Council held discussion on the Highway 169 widening project, eventually deciding to have Peters and City Administrator Anthony Brown reach out to the County Supervisors and Department of Transportation to ask some clarifying questions regarding the project. They also agreed to contract McClure Engineering with the planning phase of the project, in order to keep the process moving to use grant funds given by the DoT. Next, the Council decided to utilize direct engagement with Chris Shires of Confluence to work on updating the City’s 2009 comprehensive plan, as opposed to seeking other proposals. Other items approved included: setting a public hearing for July 10th to discuss the Southbridge development; four temporary easements for the storm water utility improvement, as well as two change orders and two pay requests for the project; and an application to the DoT State Recreational Trails program. The meeting concluded with the appointments of several individuals to various City committees and commissions.